Hello, howdy, and good afternoon! 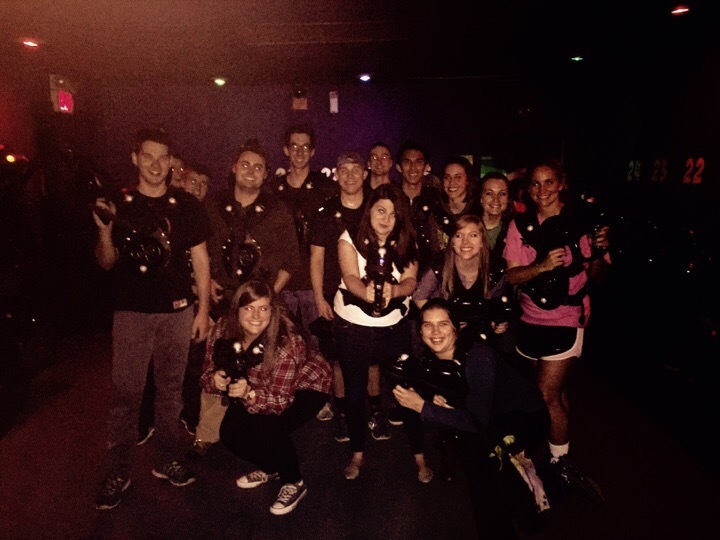 Blogger Kat here, you’re source into the amazing lives of Texas MPA students. Since I’ve been back from winter break I have taken advantage of many unique opportunities here in Austin, including comedy shows and visits from incredible authors! Here are a few of my favorite moments from the semester so far. 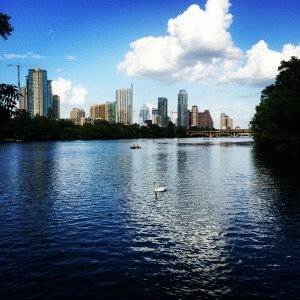 I hope you are inspired to explore all that Austin has to offer and make some memories of your own! Austin’s winter is quite different than a winter in South Bend, Indiana, where I spent my undergrad years at Notre Dame. Instead of snow and negative degree wind chills, Austin’s winter has been sunny and 75 (well, a few days have been)! 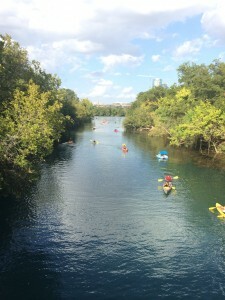 I have taken advantage of these wonderful winter days by going to my favorite place in Austin, Zilker Park, to run or kayak with friends. I just couldn’t imagine any other way to spend such beautiful days. For great kayak and paddle board rentals, we always go to Rowing Dock! If you haven’t done a water activity in Austin yet, I highly recommend it! Austin is known for its concerts and live comedy shows. A few of us MPA students took a break from our studies and went to see Kevin Hart at Austin City Limits Live at the Moody Theater, an amazing venue. We definitely enjoyed our night and laughed more than I thought possible at the comedian! This past week, I had the opportunity to see one of my favorite authors speak at the Long Center, a popular performing arts venue. 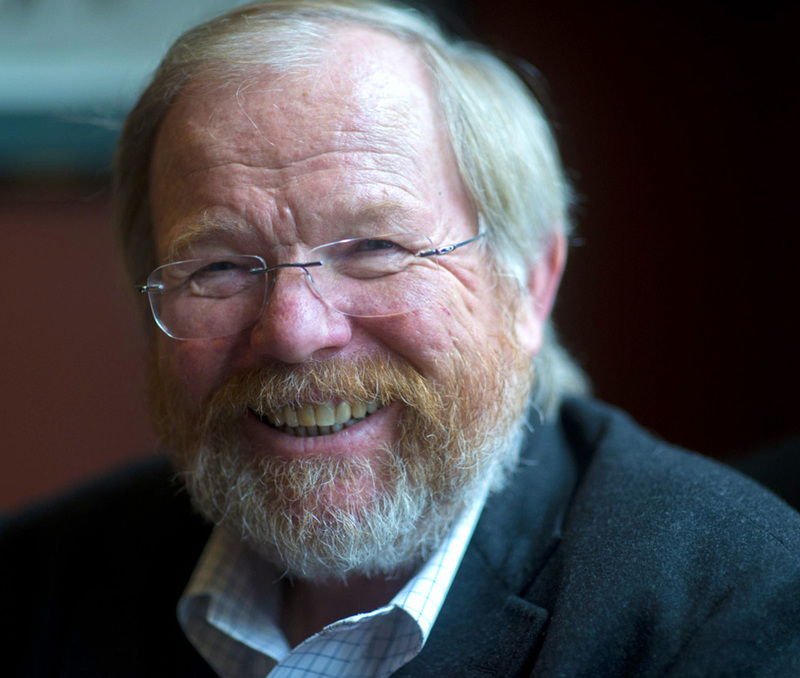 Bill Bryson was quite entertaining and delighted the audience with stories of his life and readings from some of his most beloved books. As you can see, I experienced some unique events in Austin this year and I’m on the lookout for more! Don’t limit yourself to just going out to sixth street every weekend; there is so much more that this incredible city has to offer! My friends and I have started to really venture out and I love getting to know Austin. 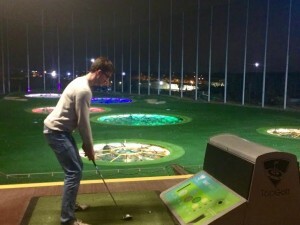 Up in North Austin, we found Topgolf, a driving range that turns golf into an arcade game, and you can enjoy food and drinks with your friends as you compete! 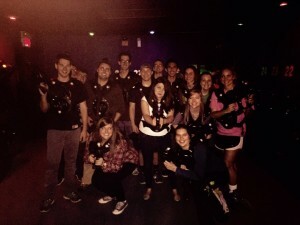 Down in South Austin we found our inner kid at Blazer Tag, chasing each other around a multilevel arena with laser guns, each seeking victory for our team. 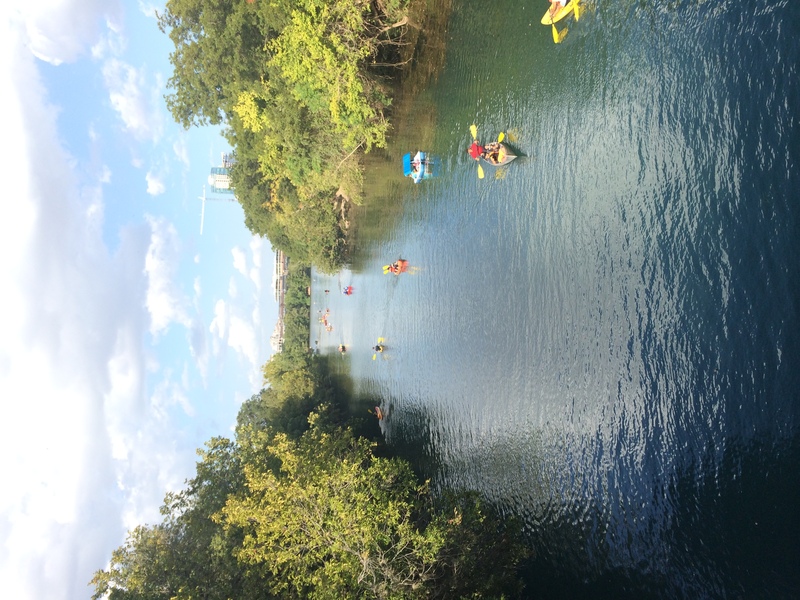 Like I said before, Austin is an amazing city with so much to offer to students. 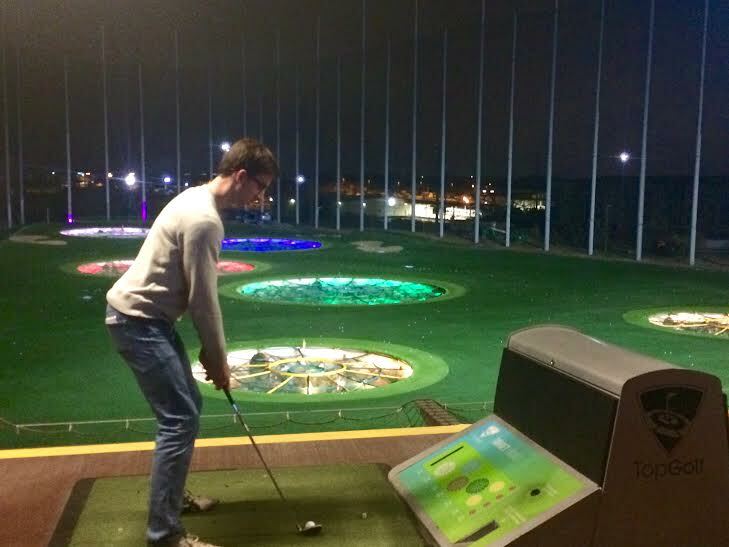 Try something new one weekend, such as laser tag or Topgolf, or seek out a concert to attend or a speaker to see. Spend some time outside at the beautiful parks and lakes that are found all around the city! You won’t regret it! Today’s blog is about recruitment. No, this isn’t recruitment for college football. No stopwatches and no campus visits to see the big game. No, this recruitment is for… wait for it… full time jobs! As daunting as this may sound, especially if you are considering joining the MPA program in the future, recruitment is an exciting time when, much like college football recruiting, you get to showcase your talents, network with the big leagues, get treated like a queen or king, and even get flown out to office visits in exotic locations such as Dallas or Austin! It is a very important time for all students who enter the program, and I would like to offer up three pieces of advice for the whole process. 1. Bring your appetite. For those of us who entered the program without full time jobs already secured, recruitment began before classes even started with a networking reception. The first part of the reception was a fancy dinner! Nothing says lets talk about work like a giant steak and potatoes! Then, after you start connecting with companies and applying for jobs, you get to go to interview pre-dinners! If you apply for four or five jobs, much like I did, then these dinners will be happening almost every night of the week for two or three weeks! And these dinners are NICE. 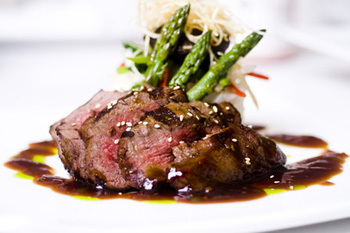 We are treated to the nicest restaurants in Austin and you better bet your buttons that dinner will include an appetizer, a main course, and a dessert! Sometimes there may even be drinks! Just be cautious about how much you drink, because recruiters are making judgments from the moment they first meet you and you want to be careful about how you come off. THEN, if you make it to the office visits, you get to go to another nice dinner in the city of the office you are going for! Again, so much steak, fish, chocolate cake, peanut butter pie. Everything is just delicious and you just keep eating and eating and eating! I think that with all of these meals, the recruiters are testing your ability to eat because as future accountants, we will always be having lunches with clients or dinners with our audit team or late night snacks with our audit team or even later night snacks… with our audit team. They just want to make sure you can handle all that food! 2. Don’t let the perceptions of others interfere with your perceptions of a company. This was something that I struggled with a lot throughout the recruiting process. 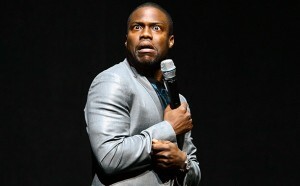 I would go to a recruiting event and absolutely love the people I met, but one of my friends might have not meshed well with the people or the company. This is okay and it will happen, I guarantee it. Everyone is different, and everyone is going to view the people and culture of a firm differently. 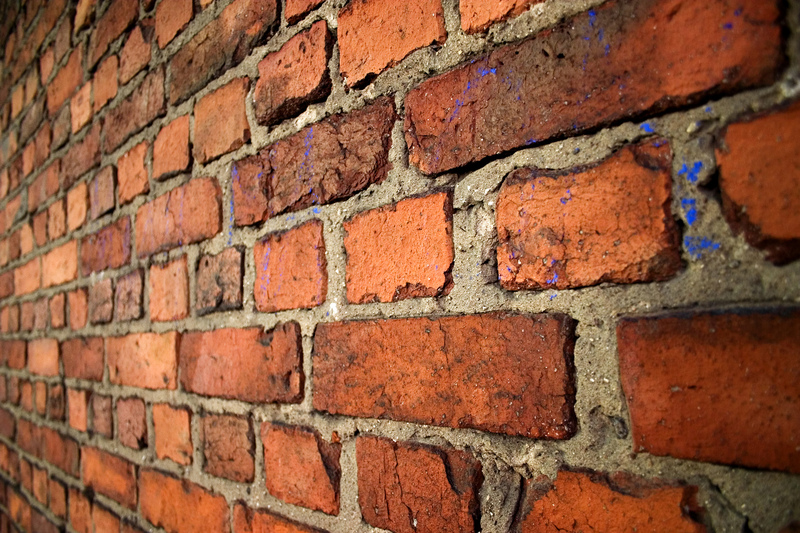 You just have to make sure that others’ perceptions don’t get in the way of your own perceptions. You need to decide where you fit in best and what people you can really see yourself with, because it’s going to be you who is working there, not your friends. 3. 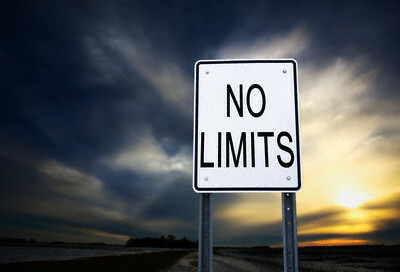 Do not limit yourself. Coming into this program, I was convinced that I had to do audit or tax, much like most people who major in accounting. However, after just beginning the program, it became very clear that our options were indeed limitless, so why not explore every option. I went to industry nights and learned about jobs with Intel and Google. I also learned about jobs with oil and gas companies. I even explored consulting and advisory within the Big 4. Just know that you are not limited in this program. If you really want to work in a certain industry, then pursue that option. Advice number 3: Do not limit yourself. Now the recruiting process is over! We all have our jobs, and are all very excited. Take time to celebrate with your fellow MPAs. You deserve it! Nothing feels better than being excited about your future job and knowing that the sky’s the limit! Even though classes are picking up and recruiting is under way, I have still made time to explore some of Austin’s treasures these past few weeks! 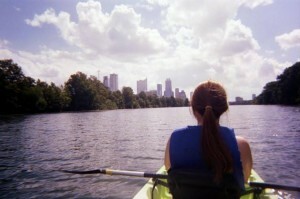 I won’t bore you with every detail of my life since I’ve moved to Austin, but I will share a few of the highlights! Fortunately for you and your stomachs (not so fortunate for mine), most of the highlights center around Austin’s hot food spots! The first place I want to touch on is one that a few MPAers and myself visited after our first speaker lyceum class. You may or may not have heard of it. Torchy’s Tacos. This famed Austin original boasts some of the most unique and delicious tacos I have ever experienced. Some of their tacos include the democrat, the republican, trailer park, and a monthly special, which was a chili cheese dog taco when I visited. They also have incredible queso, and that means a lot coming from me because I don’t even like cheese, but I will dab a chip or two into this flavorful goodness. Another Austin original that I visited with some fellow MPAers, again after a speaker lyceum class (I’m starting to sense a trend here) was Hopdoddy. This place may or may not be my new favorite place in Austin (and quite possibly the world). Hopdoddy isn’t your typical burger bar. With a line usually out the door, you meander through three different sections before finally ordering a mouthwatering burger. Don’t let the line scare you away though! As you wait, truffle fry samples with either queso or their spicy ketchup are brought out to you, and you can make a stop at the bar for a drink or milkshake while in line! I myself had a delicious red velvet milkshake as I waited (and regretted it as I later consumed a huge burger and order of truffle fries)! Enough with the food, though, before we all burst out the nearest door to get some grub! Let me now sway you with some Austin outdoor and live music fun! 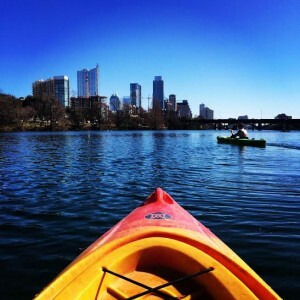 A great thing to do on the lake is to rent a kayak or canoe with your friends and see the city from the water! Don’t let three boys get into one canoe, though, because it is sure to tip at some point (with boys being so mature and all) and you will have to perform an intense kayak/canoe rescue mission to tip the canoe over free of water! That’s all for now on becoming a local! Stay tuned for further Austin adventures!